My in-laws were here for dinner last night and we had Lemon Buttermilk Pudding Cake for dessert. 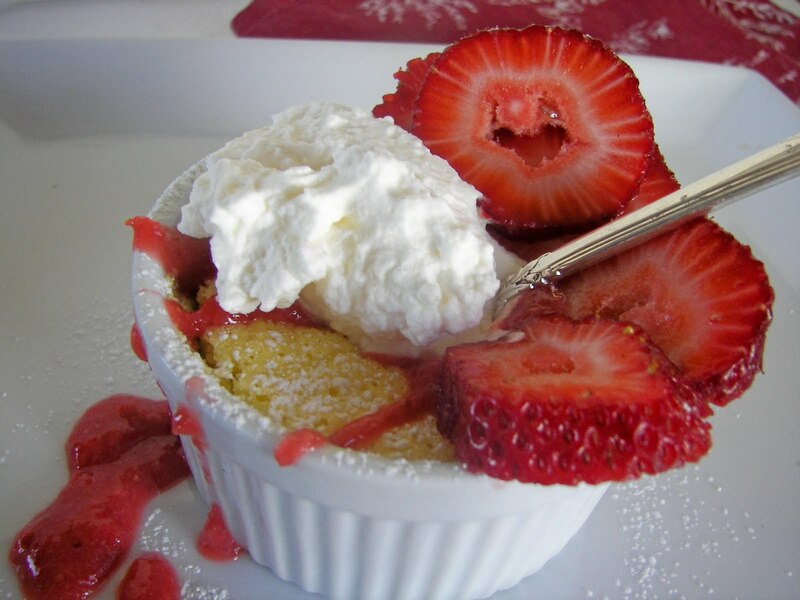 We have made this dessert on numerous occasions and love it everytime. Last night we served it with a strawberry sauce and fresh strawberries and whipped cream. During the winter I have made it with a raspberry sauce and topped it with frozen raspberries and mango. You can use whatever berries you have on hand. It is easy to make and delicious, light, and lovely! I found this recipe awhile ago on Crabby Cook's website where she cites Bon Appetit magazine as the original source. The original recipe calls for Meyer lemons. I have made it once with Meyer Lemons, but they are a very seasonal fruit and difficult to find where I live. I usually make this recipe with normal lemons. I also altered the recipe to make it in ramekins, because I love baking and cooking with ramekins. Fresh Berries and Sauce -- See recipe below. Preheat oven to 350 degrees. 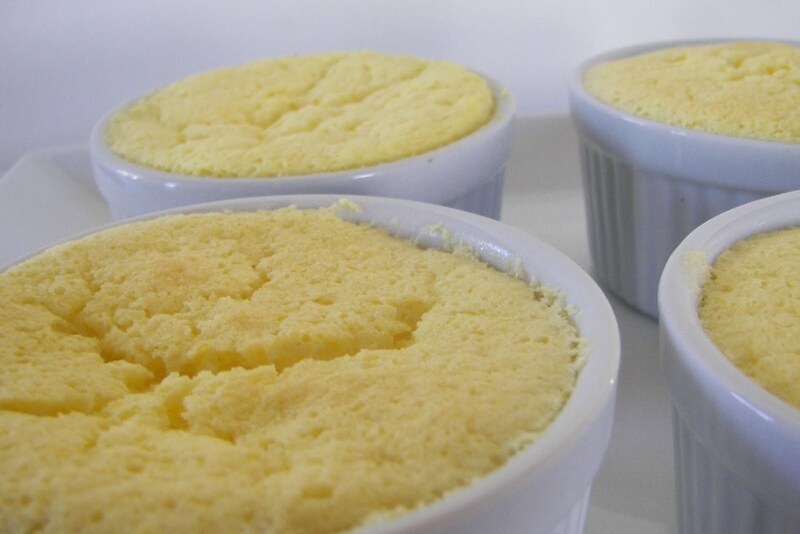 Butter eight (6 ounce-sized) ramekins or an 8x8x2 glass baking dish. Blend buttermilk, 1/2 cup sugar (reserve other 1/2 cup), egg yolks, lemon juice, flour, butter, and salt in a blender until smooth. Set aside buttermilk mixture. Using an electric mixer, beat egg whites in a large bowl until stiff peaks form. Gradually add reserved 1/2 cup sugar, beating until stiff, but not dry. Gently pour buttermilk mixture into the beaten egg white mixture. The batter will be runny. Pour batter into prepared baking dish(es). With the ramekins I used, I poured about 1/2 cup of batter in each. Remember, that you need space remaining at the top for the pudding cake to rise a bit. Place dish(es) into a roasting pan and then into the oven. Pour enough hot water into the roasting pan to come halfway up the side of the baking dish(es). DO NOT GET WATER INTO THE BATTER. Make sure you pour the water in the roasting pan while it is sitting on the oven rack! It's hard to transfer the roasting pan to the oven with water not splashing into the ramekins. For ramekins, bake for 26 to 30 minutes until the tops are slightly light brown and springy to the touch. For square baking pan, bake for about 40-45 minutes until slightly brown, springy to the touch, and the center moves very slightly in the center. As ovens vary, watch carefully while baking, especially for the first time. When done baking, remove baking dish(es) from oven and allow to cool on a rack. When cooled, it is best to refrigerate for at least three to six hours. In a pinch, although not as good, we have also just eaten them when cooled. 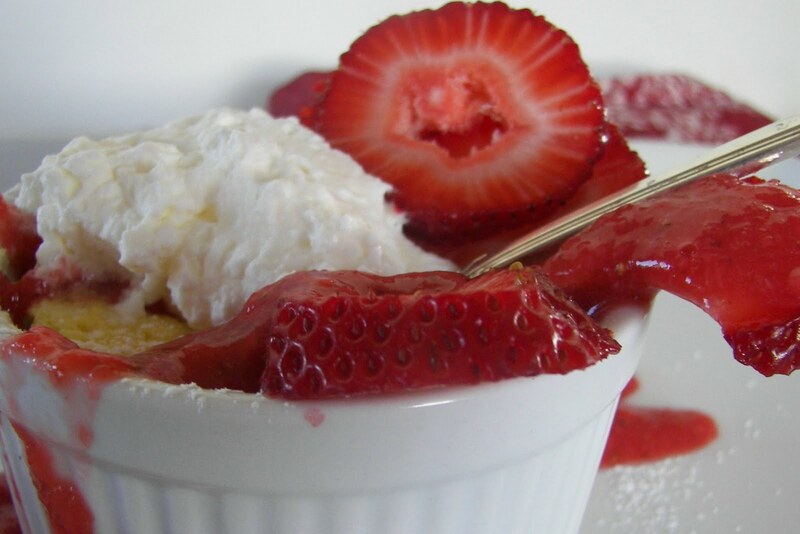 Top with berries, sauce, and whipping cream. If you want to make berry sauce, see below for recipe. Take strawberries (1 pound package, less several for garnishing) and puree in blender. Add some sugar to taste, from about three tablespoons to six tablespoons depending on the the sweetness of your berries. Place berry puree in small saucepan and on medium heat bring to a slight boil. Remove from heat. You can also do the same with an unthawed frozen berry package. Skip to My Lou's Made By You Monday. The Girl Creative's Just Something I Whipped Up Mondays. Blessed With Grace's Tempt My Tummy Tuesday. Balancing Beauty and Bedlam's Tasty Tuesday. This sounds similar to a buttermilk pie minus the crust. Nice change to make into single servings and good to take to friends for dinner. This looks so tasty! Thanks for sharing! This is my first time visiting your blog. I'm stopping by from Made by You Monday. Lemons and buttermilk - yum! Lemons are my chocolate! 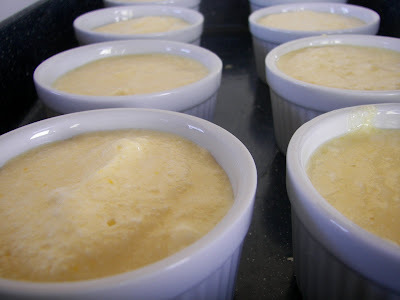 I'm off to measure my ramekins - this looks so good! Oh so yummy! I have the buttermilk and limes. Have you ever tried it with lime? This is my kind of dessert. I'm going to give this recipe a whirl. Thanks so much! Yum! You had me at the strawberries. Sounds delish!! Thank you so much for stopping by my blog. If you put your bike in your garden I would love to see the results! I love lemon! Your pudding cake looks absolutely delicious! This looks absolutely phenomenal! Love it! Yumm! It looks like a perfect dessert for Spring & Summer! I have made this before and it is very yummy. I have a lower fat version too. Yum, yum! These look delicious! And so much like summer!